that's the link to the FULL 3rd trailer! : D OMEC! IT'S AMAZING!!! Oh, I tried to watch it but it said it's taken down due to copyright laws. debussygirl wrote: New behind the scenes of Twilight!!!! Contains behind-the-scenes of the Cullen house, when Bella confronts Edward about being a vampire, THE MEADOW SCENE, Alice taking Bella off to Phoenix, and the ballet scene. Really amazing!! OME!! That WAS amazing!!!!!! Every little clip I see just makes it harder to wait!!!!! Gahh!!!!! LOVE the part where Rob is like "and I can't scare her away....because she loves me!!" the way he said it was hilarious! This is 8 MINUTES of movie magic! Actual footage! I am not kidding; it will totally make your day, as well as literally make you salivate for November 21. I work in PR for Borders, and we have a bunch of video clips on our website -- interviews with the cast, behind-the-scenes footage, and more. Go to http://www.bordersmedia.com/twilight. Borders is THE place to go for everything Twilight! 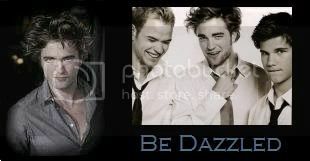 Visit http://www.bordersmedia.com/twilight for exclusive behind-the-scenes video clips. I want to watch the official 8 minutes released at the Rome Film Festivel, but....I CAN'T! My body physically won't let me! Haha, but seriously I'm not gonna watch any more clips they release. Does anyone else agree that theyre showing a bit too much? Like I really want it to be a surprise. #1twi-guy wrote: Oh. My. God! I agree!! I see all of these clips and links, and I AM SO TEMPTED!!! I watched the first bit of the "Bella meets the Cullens scene" and I couldn't bring myself to finish it. I want it to be a suprise and a rush. I don't wanna see all bits and pieces online. I definately agree, #1twi-guy!!! But it is so tempting to watch all the footage. At first I didn't want to watch ANY footage until the movie came out and that I couldn't keep that up for even a week. Having said that, I almost DIED watching that 8 minutes of footage. It is so amazing and I keep watching it over and over. I love how adorable Alice is, Ashley is perfect and Nikki did an amzing job with the whole ranting Rosalie thing! I cannot wait for 13 more days to see the movie!